Personalised Hoodie featuring a lovely star and gymnast with a name of your choice. Choose from 14 hoodie colours and 8 front design colours. Available in the following sizes: 1/2 years, 3/4 years, 5/6 years, 7/8 years, 9/11 years, 12/13 years. Double fabric hood and kangaroo pouch pocket. Ribbed cuff and hem. 80% cotton / 20% polyester. 280gm. Also available with heart design instead of star. 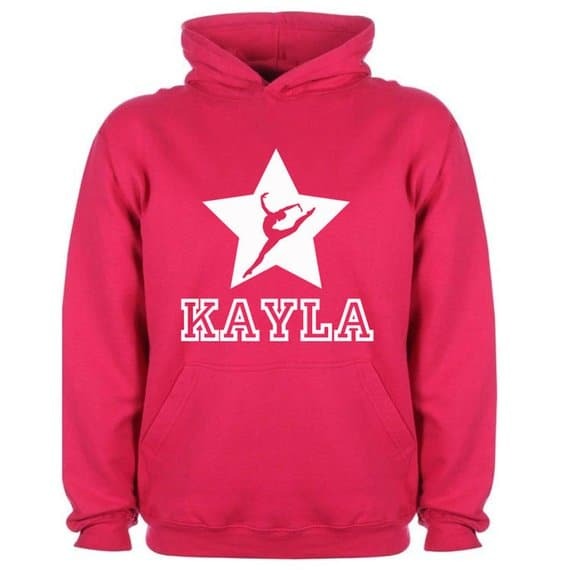 A lovely personalised hoodie featuring a lovely star and gymnast with a name of your choice. Each hoodie is personalised to your choice of colour and size and we can add a first name (or nickname if you prefer!). Secondary Colour Option refers to the colour of the main design on the front of the hoodie. Kids Hoodies with twin needle stitching detailing.